We find the overall quality outstanding, the fit and finish is as good or better then most of the other manufacturers we carry which are over double the price. The Vegas range uses the PSA line in their full auto rentals and have nothing but good things to say about them. 40000 round counts are not uncommon before any maintenance requirements, keep in mind these are running full auto all day long. Best rifle for the $$$ bar none.. our .02. I’m super excited for mine, what other manufacturer would you compare the quality too? Any idea when you'll be getting more 10.5" in the Canadian store? The M-Lok version? 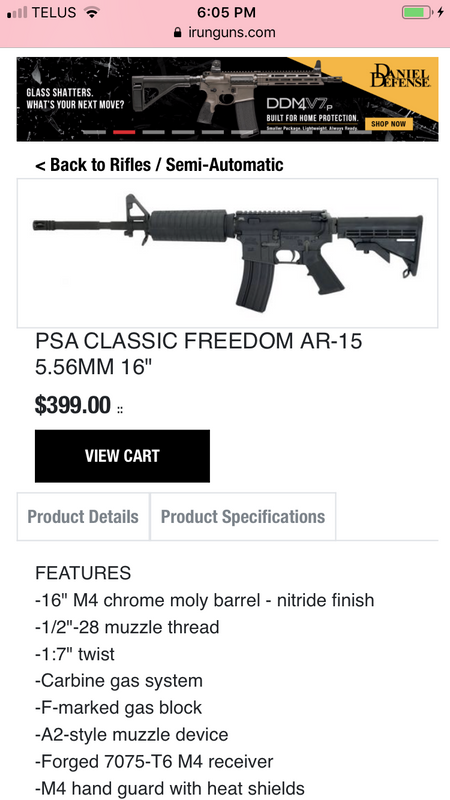 You have a 10.5" in the US store with the fixed front sight... And I'm +1 on just selling the 10.5" uppers in Canada!! We have a bunch of these and the Iron City rifles with 10.5 barrels going to Canada tomorrow. Any pics of the iron city ones? I love my PSA 10.5. Just upgraded the sights to a holosun 510c green dot with the solar panel backup. It’s a perfect CQB gun, points fast and cycles reliably. My only gripe if I had to chose was keymod and safety doesn’t click, it just rotates over. Amazing gun for the price, thanks Irunguns. When will they be on the Canadian website for purchase? If your safety doesnt click theres something wrong. Did you lose the detent when switching grips? All items shipped by canada post expedited with tracking and $100 insurance included. Insurance above $100 coverage is on the buyer. I'll need to see your PAL for firearms. Any PSA 10.5" uppers on the truck? "First comes smiles, then lies. Last is gunfire"
When forced upon the masses, even Utopia becomes Tyranny.